State workers don’t really know much about how AFSCME spent $7.7 million on politics. That’s because records don’t detail and the union’s Illinois chapter obscures how most of the money was used. The American Federation of State, County and Municipal Employees Council 31 spent more than $7.7 million on politics during a four-year period, but how more than half of that money was consumed remains a mystery to union members. Federal reporting documents show Council 31 used that amount for political activities and lobbying from 2013 to 2017. But lax reporting requirements allow the union to hide the full array of its political spending. Much of the money funds political activities and lobbying performed by union officers and employees, but union leaders aren’t required to list what those political or lobbying efforts were. More than $4.2 million of the $7.7 million the union spent on politics between 2013 and 2017 paid for political activities performed by union officers and staff, in addition to other non-itemized disbursements. In other words, more than half of Council 31’s political expenses during the past five years remain completely unknown. The union claims to represent 75,000 government workers, of which about 40,000 are Illinois state workers. Members have diverse political views, but little information and no choice regarding how their union’s political agenda impacts those views. Often state workers have no information about what activities they’re funding. What’s worse, Council 31 leaders have been deceptive at best in explaining the union’s political activity to members. 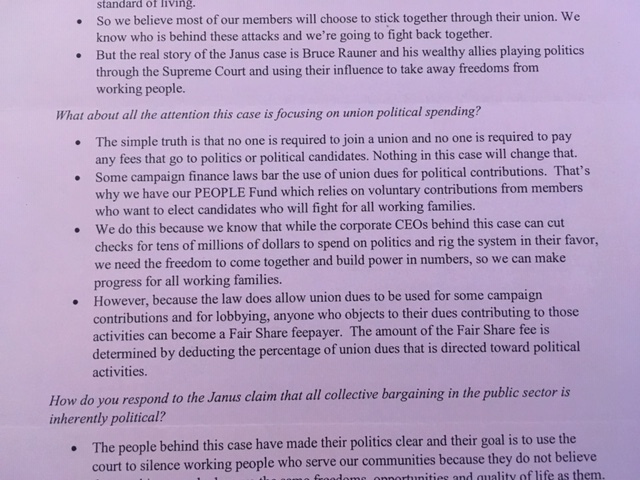 AFSCME literature distributed to union members often makes the claim that “no one is required to join or pay any fees that fund political activities.” But that phrasing is disingenuously vague. 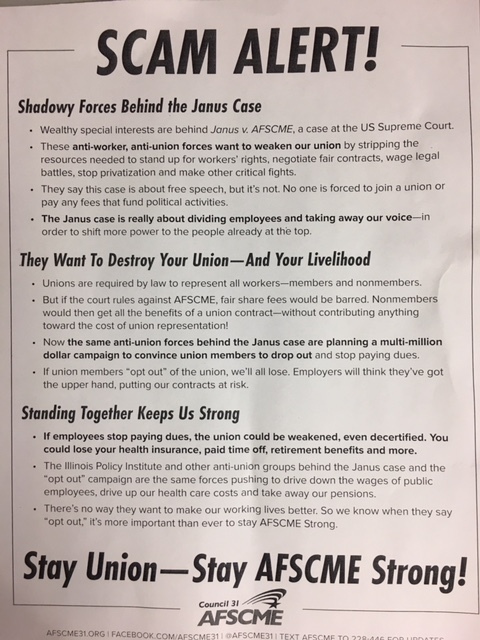 While it’s true no worker is required to join a union, those who do are indeed forced to fund political activities, a fact made unclear in many AFSCME handouts. Moreover, the union’s federal filings only document a portion of Council 31’s political spending. Filings with the Illinois State Board of Elections reveal Council 31’s PAC spent more than $6.8 million on political causes and candidates in Illinois between 2013 and 2017. The degree to which the union spends money electioneering often reflects prominently in the General Assembly: In 2017, 104 of 177 state lawmakers – or nearly 3 in 5 – had received money from Council 31’s PAC. Much of members’ dues money does not stay in the hands of the local leaders they may trust. Member dues also flow to AFSCME headquarters, which federal reporting documents reveal spent more than $205 million from 2013 to 2017 on political activities and lobbying across the country. Because all members of Council 31 are by extension members of AFSCME headquarters, a portion of their dues is directed to the union at the national level and, therefore, to the political causes the headquarters supports. 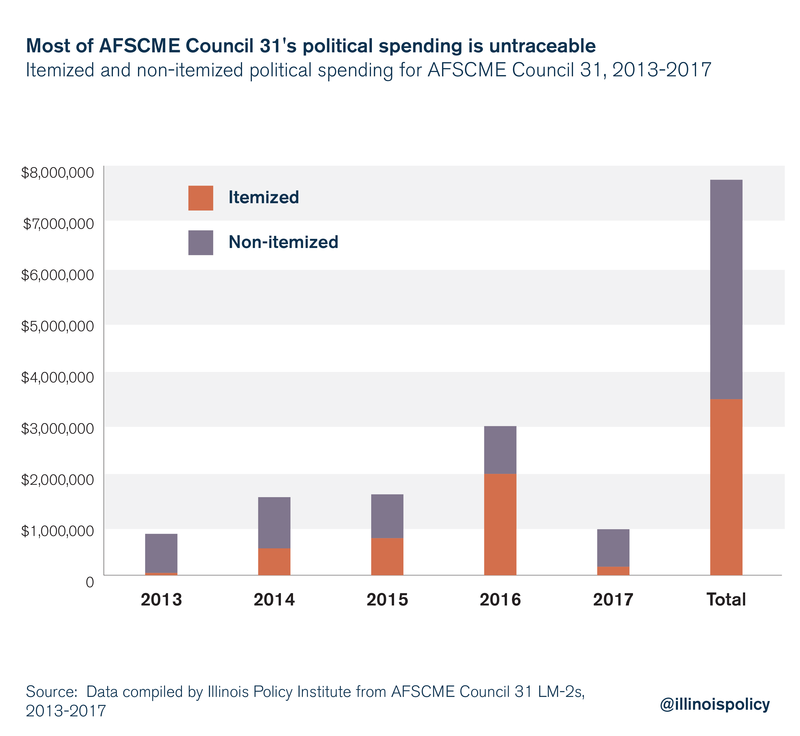 Local union members have no say in the spending patterns of AFSCME headquarters, and indeed, the union-funded organizations that many members may oppose. If you are a public sector worker in Illinois and would like to exercise your right to stop paying money to the union, visit leavemyunion.com. If you would like to stop sending money to AFSCME, visit leaveafscme.com.